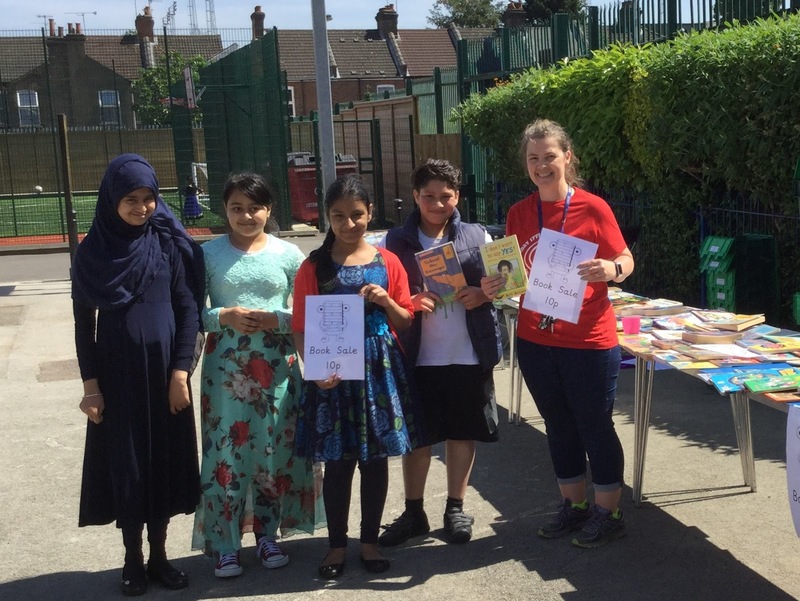 Beech Hill school in Luton made a friendship agreement with the Lower Basic school in Sohm earlier this year, and has pledged to try and raise money for their Gambian friends over the next three years. The school dedicated the money it raised from World Book Day, in March, to helping the school - and raised £1,000, to help restore broken the classrooms we mentioned in the last newsletter. 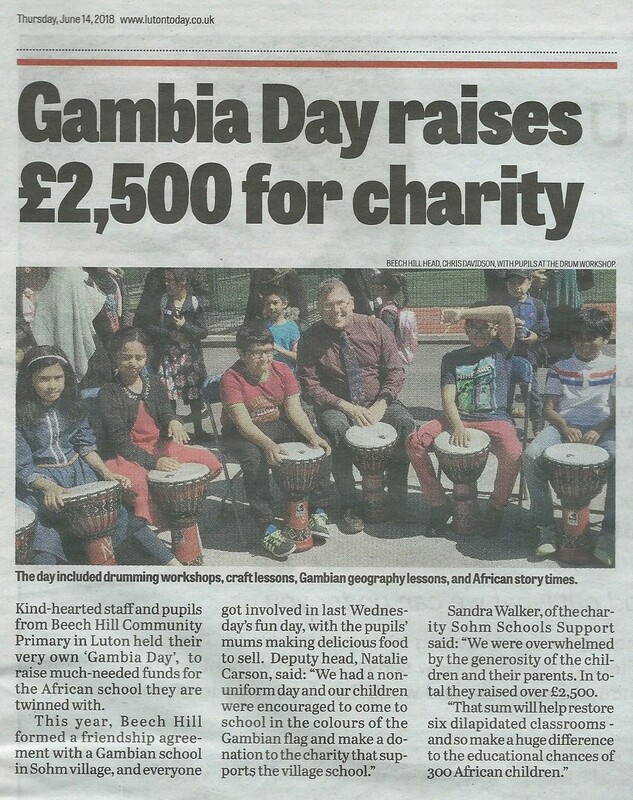 The school held a "Gambia Day" on 6 June and invited Sandra and John from SSS to participate. made us look so obese in the photo below! It was declared a "non-uniform" day, and pupils were encouraged to go to school in the colours of the Gambian flag - and make a donation of £1 for not having to wear their uniforms. Sandra and John took two assemblies for the 900 Beech Hill pupils, and took them through the school day of a Sohm youngster. The rest of the day was devoted to The Gambia in the school, and Sandra and John were delighted to visit all the classes and see they pupils hard at work. There were geography, craft, singing, story-telling and art classes. Drumming workshops were held in the school and at the end of the day, surplus library books were sold off to pupils and parents - with the proceeds going to SSS. A major highlight was provided by many of the mums in the school. Parents had asked from food donations from local traders and the mums cooked a large amount of delicious food - curries, rice, samosas etc - for sale to parents picking up their children. The fantastic efforts from the donating local traders, superb mother-cooks, and generous parents raised £1,500. 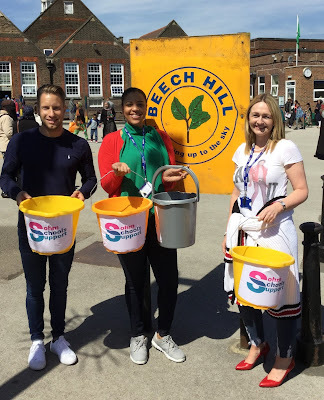 A "bucket collection" was also held outside the school gates as parents picked up their children from the school gates. In total, a fabulous £2,500 was raised on the day for Sohm Lower Basic school. That sum, together with the money raised on World Book Day has enabled us to sign a contract with a Gambian building-for-not-for-profit organisations for the school. It will mean that six classrooms in a serious state of disrepair (see previous post) will now be renovated over the school summer holidays. This is truly fantastic. far more than we could ever have wished for. It means the lives of 300 African school children will be immeasurably improved as a result of the generosity of the Luton school. The local Luton newspaper - Luton Today recognised the efforts too - as the extract, below, from last week's edition shows. They made an even larger splash on their website, and you can follow the link here. The website is a little temperamental, so we've pieced together the article, from screen grabs below. Sohm Schools Support updates direct to your inbox.